Marriage celebrates coming together of two individuals who take a step into a new world filled with promises, dreams and hopes. Somewhere down the road, the couple loses sight of these and starts to feel strain and pressure. To survive this tumult in the relationship, they either rely on their own mental strength or in some cases; the help of an experienced professional often helps put ideas back into perspective. Marriage Counseling is emerging as a popular form of therapy and guidance that is helping many couples tide over their marital issues. Marriage Counseling is a process where a qualified professional endeavors to recognize and manage the various issues and troubles that the couple is facing. The counselor attempts to reconcile the differences and save the marriage from the point of distress. A traditional version of the Marriage Counseling has been into practice for many years where couples talk to close friends and family who try to solve the differences but sometimes the intervention of a professional is required for the same. Professional Marriage Counseling has several benefits and so many couples resort to this as a means to save their relationship. The counselors treat your case as an individual and special scenario. They treat your family as an independent unit which enables them to offer suitable advice. The professionals offer an unbiased opinion which cannot be expected from families and friends. Marriage Counseling offers more privacy. A counselor opens channels of communication which help resolve problems effectively and clear misunderstandings. They can help spot out the deep seated issues and problems that both the spouses have ignored. The professionals can recommend activities and tasks that the couple may have to do together which will help smooth out any creases in the relationship. In situations where children are involved, the counselors are specially qualified to handle such cases to ensure that the children are not stressed or pressured. 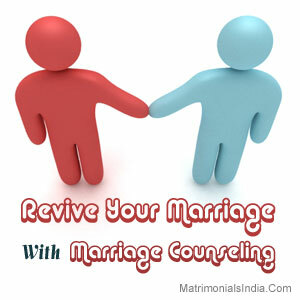 Going for Marriage Counseling is a step that the both the spouses have to take together. Marriage is a very special bond that has to be nurtured and strengthened with time so that it will blossom to a happy future and a little professional intervention can go a long way to establish this. Thanks for this informative article on reviving marriages.